A long standing customer of Aston Workshop brought his beloved MKIII Drop Head Coupe to us recently with a range of engine faults relating to coolant loss and pressurisation of the cooling system. 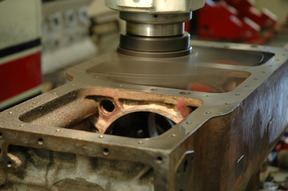 The cylinder head needed to be removed to ascertain the cause. 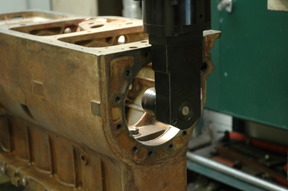 Upon inspection of the cylinder head, major cracks were found in number 1 cylinder combustion chamber. The main crack had proceeded from the exhaust port through to the inlet port. More worryingly, there was a further crack proceeding into the spark plug hole. 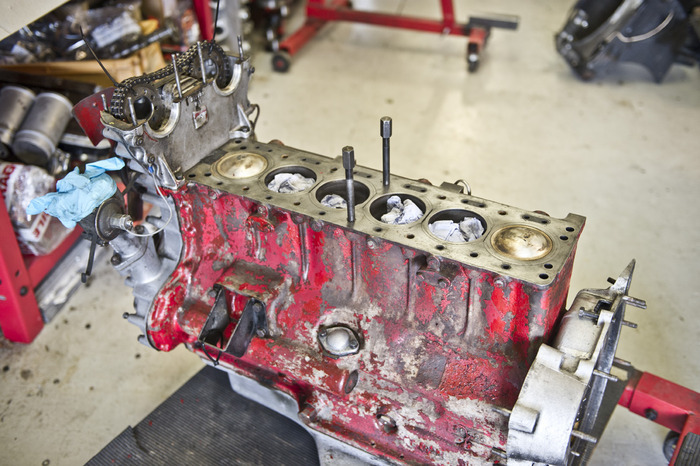 The cylinder head was fully stripped and a pressure test confirmed our fears. 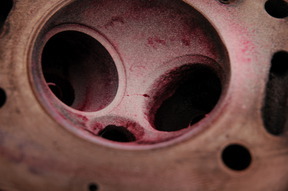 The cylinder head was not only leaking from the "port to port" crack but also deep inside the spark plug hole. Due to the complexity and related costs involved in the repair, and also the subsequent additional work required to bring the cylinder head back to a serviceable condition, we advised the best course of action was to use a new aluminium cylinder head. Before proceeding with the new cylinder head fitting, further checks were necessary to ensure all was OK with the bottom end of the engine. On further inspection we found heavy water corrosion in number 1 and 6 cylinder, bore wear and un-even, out of tolerance liner heights and a poor sealing face on the cylinder block itself. Our customer was very much of the same opinion as us. That fitting the new cylinder head to a unreliable/unknown bottom end would lead to future unreliability, disappointment and ultimately much more expense. As a spirited driver the decision for our customer was simple. A full engine rebuild would be required. 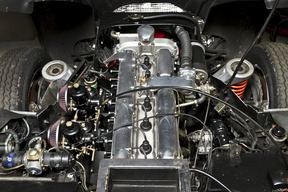 The engine was subsequently removed from the vehicle for a complete overhaul. 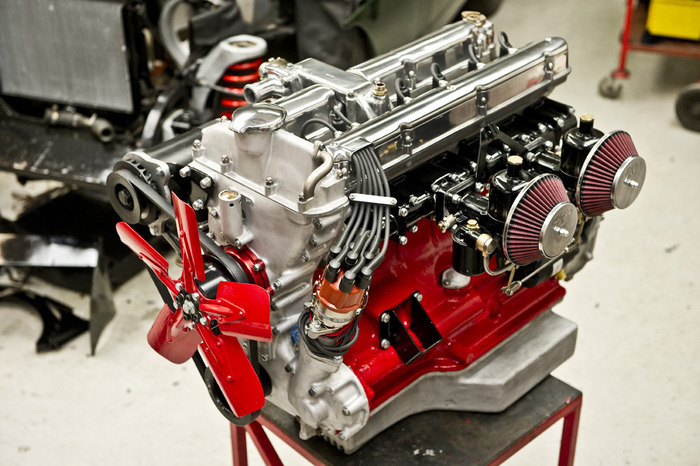 · And to improve cooling, a new high flow water pump and aluminium radiator. The customer also requested a modern power steering system to be installed whilst we had the car. 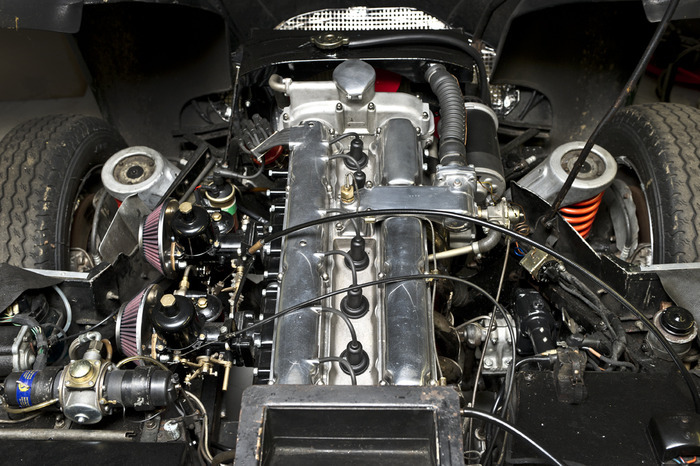 Using the Aston Workshop MKIII upgrade package, we are able to create a strong, reliable and very versatile engine with a substantial increase of torque and power right across the rev range. The engine was built, tested, tuned and fitted back into the vehicle on schedule. Much to the customers delight!